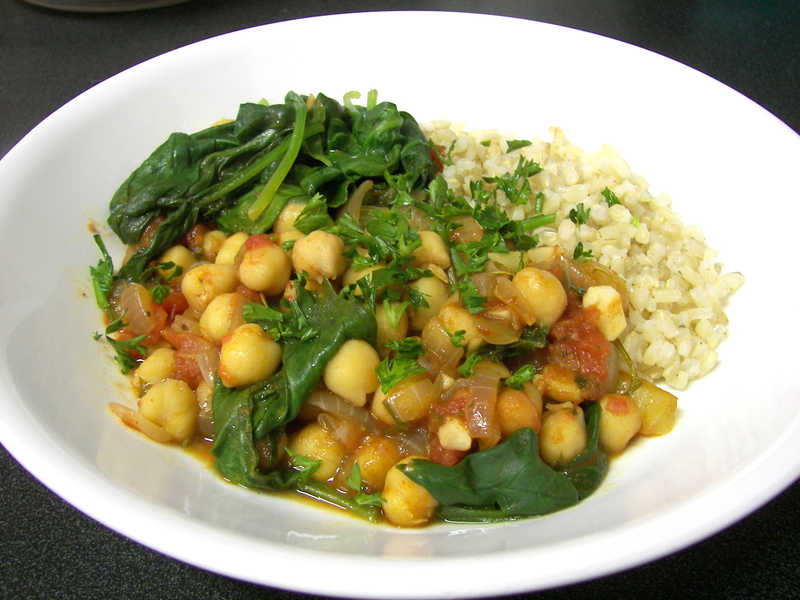 This was a tasty and super easy vegetarian meal. It’s one of those stews that is even better the second day! This recipe was adapted from one of my favorite cookbooks, Vegetarian Cooking For Everyone by Deborah Madison. In a wide saute pan, heat the olive oil over medium high heat. Add the onion, garlic, red pepper flakes, paprika, rosemary, and half the parsley. Saute for 5-8 minutes, lowering the temperature to about medium heat. Add the tomatoes and chickpeas and season with sea salt and ground black pepper, then cover and simmer for 15 minutes. Remove the lid and place all the spinach on top, put the lid back on and let the spinach steam for 3-5 minutes until wilted. Easy! I served this dish over brown rice. on October 5, 2010 at 1:25 pm | Reply I need more quick & easy dinner ideas! « Ask Maya!